Interstate relocation of southern shelter dogs is an industry screaming for stronger oversight by government, for all the reasons this article touches on and more. 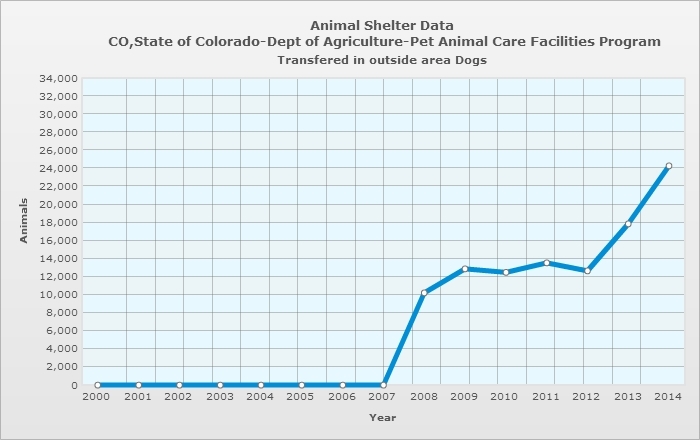 Transported animal’s health, consumer protection, origin state social policy, destination state fiscal responsibility, the integrity of the 501(c)3 not-for-profit structure that exists to promote and benefit legitimate charitable organizations and causes, and yes, the debate-able but unmistakable degree of profiteering of individuals and organizations involved in this national mess. “We don’t make a dime, we’re just saving lives” is no longer an un-challengable or legitimate argument, absent proof that this is so. Charitable organizations may not lie to the public, and for interstate relocation there should be full transparency. Own and take pride in that transparency. Prove you make no profit. Prove your dogs do not come from foreign countries and add to our national burden. Prove what you claim in your ads and websites. Comply with every state and local laws and stop delivering dogs on weekends, in parking lots, intentionally away from the eyes and reach of the law. Only then can the public be expected to believe you are not in it for you. I strongly agree with the issues you present to NAIA. Why are Amish Farmers still providing puppies that are brought into this earth in an inhumane fashion and selling them to so-called rescue agencies listed under NAIA. The horrible conditions under which the Amish produce these puppies is too much for me to write about at this time. NAIA certainly is aware of what is going on with their “so-called” rescue agencies purchasing puppies from the Amish as low as $5 a piece and then selling them — just as you described, i.e., “delivering dogs on weekends, in parking lots, etc.” along with using major pet food stores to use their space for conducting transactions. They promote the sale of full-breed puppies — which is the mission Patti Strand on the NAIA Board — promotes. Her words are on the internet if you investigate further. Stop the horrible, inhumane conditions dogs are going through to produce puppies! The Amish have a technique to quiet the dogs producing the litters over and over again until they are useless. They jam instruments down the throats of dogs to damage their vocal cords. When will this stop!! Quit the cycle of purchasing full-breed pups from Amish and other inhumane sites. NAIA has to be reading and seeing everything we see on the internet. NAIA has made it public that they want full-breeds back in society. They need to be more concerned about getting good dogs — whether they be old, young, mixed, etc. that are in need of homes into homes. Yes, prove you are a non-profit to the public. We need to bring these issues up to our State Representatives. We need them to listen to our voices that don’t warm the horrendous harm that is currently being done to dogs that breed to continue. STOP!! and, yes, of course, if you stop — the financials will suddenly dip to $0 from the billions produced in the animal industry. Accusations without facts. Activist organization dogma regurgitated. Please, do not insult me by claiming you actually believe the “internet” is an accurate reference that closes all debate. Further, generalizing and demonizing a minority ethnic group is racist and has no place in civil discourse. What’s your point? That dogs should be raised humanely? Well of course they should. Yet that doesn’t alter the facts. Less than 5% of shelter dogs are demonstrably purebred, which means it isn’t intentional breeders, even bad intentional breeders, that lead to the majority of shelter euthanasia. It’s instead human irresponsibility on an individual basis. Conflating purebred breeding with shelter population issues is no longer acceptable. People have a right to own a dog breed that they choose, and to raise it from puppyhood rather than be forced to adopt a young adult. Blaming all purebred breeders, or a small minority group with no public voice, for today’s animal welfare problems is easy to do, but plain wrong. The problematic industry today is not intentional breeding but its competitor, the one which operates under the veil of not-for-profit tax laws but transports and sells young adult dogs of unknown provenance, while claiming they are “just saving lives”, “making no profit” and “obey all laws”, when many recent news stories prove otherwise. State laws to control this activity would not have been necessary had this new industry been fully aboveboard. Well past time to stop blaming those who provide animals to families transparently and according to law, and claiming those who operating opaquely and above or beyond the law are the animal welfare heroes. The reverse is much closer to the truth. There’s no need for the trafficking. 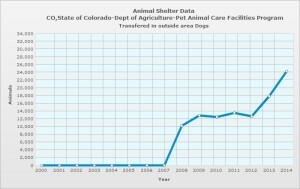 Every state has shelters full of dogs. country shelters and no where for them to turn. term reduction in unwanted puppies/kittens.